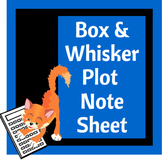 Challenging questions lead students justify conclusions based upon box and whisker plots that they construct. 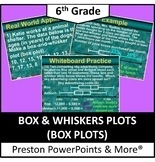 Zip File includes: SmartBoard teaching tool, student note and class work pages (PDF) and homework assignment (PDF). 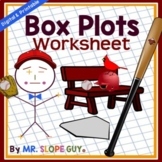 EXTRA BONUS - SmartBoard file with homework answers and explanations. 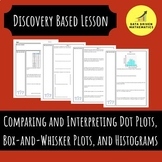 Also included in: Data Analysis Bundle: Dot, Box, and Stem & Leaf Plots, Histograms, and More! 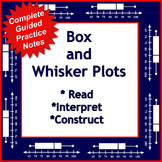 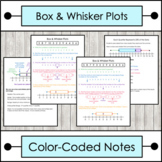 Notes covering how to draw a box and whisker plot. 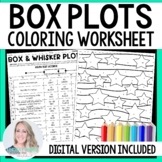 Each step is color coded to match a part of the picture provided. 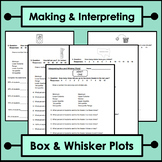 It provides synonyms for the different points so the students will be familiar with various vocabulary words. 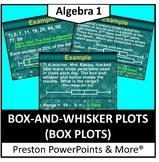 Examples: upper quartile or 3rd quartile and upper extreme or maximum. 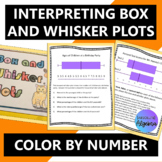 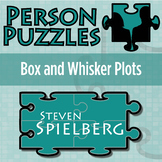 This assignment will measure your students knowledge of creating and interpreting both box and whisker plots and stem and leaf plots. 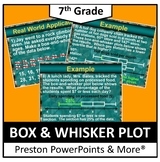 ** Created in a word document so you can easily adjust as needed to fit the needs of your individual classroom.